Organizations that promote Lean management teach people how to focus on the process, think scientifically, do experiments, observe, engage in problem-solving, identify root causes, respect people, improve continuously, and, above all, learn. Yet, when to comes to Lean transformations, their focus is Lean success, while Lean failures are ignored. Good science looks at all the data – both good and bad. Ignoring Lean failures goes against everything they teach, and gives the appearance of having a greater interest in self-promotion than actual Lean success, and more interest in their fate than their customers. The ubiquity of Fake Lean informs us that there are significant defects in the Lean transformation process that contribute to failure. The steady volume of complaints about Lean by workers over the years should have been an unmistakable signal that a big problem existed and therefore need attending to. But that has not yet happened, despite nearly three decades of clear signals. Shouldn’t a scientific approach be taken to this problem as well? 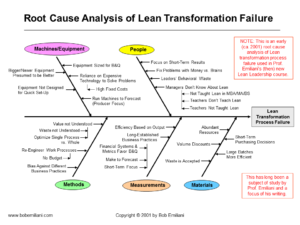 What are the Lean transformation process defects? What are their root causes? And what countermeasures can be applied to prevent their recurrence? As an engineer trained in formal failure analysis methods in school and having applied it for many years in industry, I have always thought it important to apply that same reasoning and process to business and management failures, including failed Lean transformations. Unfortunately, when such failures occur, most people ignore causes, guess at causes, or simply move on. And they apply ineffective countermeasures based on guesses, such as personnel changes or a new organization chart. Senior managers, shareholders, unions, the business press, and other stakeholders don’t care about failure analysis. As a result, the learning is lost, and the failure will be repeated sometime in the future and cause harm to employees and others. My first experience with Lean at Pratt & Whitney in the summer of 1994 led to a realization a few months later that some of my colleagues were succeeding while most others were failing. I wanted to know why? This question has informed my research and writing for that last 18 years. The first two papers I wrote in 1998 were in response to the difficulties that I observed among my fellow leaders in the manufacturing facility that I worked at. The papers identified practical countermeasures to help assure Lean success. My six-volume REAL LEAN book series, my book Moving Forward Faster, and my workbook Practical Lean Leadership are all focused on identifying the root causes of failure and how to correct them, principally from a leadership perspective (one of several cause categories). I taught M.S. and M.B.A. students in a business school after leaving industry. I was amazed to see the perspective from which business was taught to students. It was almost exclusively from the standpoint of success – what big-name companies did right. Failures were ignored. Strangely, scientific thinking was not common among business school faculty. And there was no formal method to analyze business or management failures. The closest was a derivative of the Socratic method used in case study teaching where the professor facilitates students in discussions to identify alternative courses of action. That’s not good enough. So in the summer of 2005, I created a new graduate course called “Failure Analysis of Management Decisions.” And I created a formalized process for students to use to determine the root cause of failure and identify practical countermeasure. It is called the “A4 Failure Analysis Method,” and is described in Appendix IV of Moving Forward Faster. The process has been revised and improved more than 15 times over the last 10 years. In addition to analyzing various types of business failures, we also analyze Lean transformation failures. A majority of students always say that the course is one of the best they ever had because of all the practical things they leaned and which they can apply at work. So much about Lean management revolves around the worker who is doing value-creating work, and how management must support workers. It is not just management that must support the workers, the recognized leaders of the Lean movement must do so as well. Formal engineering-type failure analysis must be applied to Lean transformation problems to illuminate the precise source of the problems so that corrections can be made to prevent future failures. Without such analysis, no corrections are made and the failures continue unabated, causing much frustration and damage to people and organizations. Worker’s persistent complaints about Fake Lean can no longer be ignored. 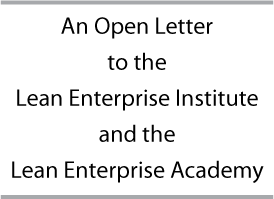 I recently wrote an open letter to the Lean Enterprise Institute and the Lean Enterprise Academy (click on above image to read the letter). In the letter, I suggest that they are remiss in their duties if they do not focus on Lean failures because they are ubiquitous and because there is more to learn from them than there is to learn from success. I offered to give them all of my books and papers on Lean failure analysis, and also offered to give them the A4 Failure Analysis Method template. And I ask for nothing in return. I know from the strong positive response on LinkedIn and Twitter that there is a lot of pull for formally analyzing Lean transformation failures. People are tired of Fake Lean. Something must be done. Apply Lean principles and methods to this problem so that Lean management can move forward, faster. Click here to learn about other abnormal conditions where the Lean Enterprise Institute and the Lean Enterprise Academy should take the lead. At one time or another, we have all been customers of the Lean Enterprise Institute or the Lean Enterprise Academy. We’re the customer. Please read my open letter. If you agree that this is a task that they should undertake as part of their regular efforts, then please join me and put some friendly pressure on them to satisfy your demand to learn the root causes and countermeasures of failed Lean transformations. Please send them the link to this blog post or a copy of my open letter with your thoughts added to it. 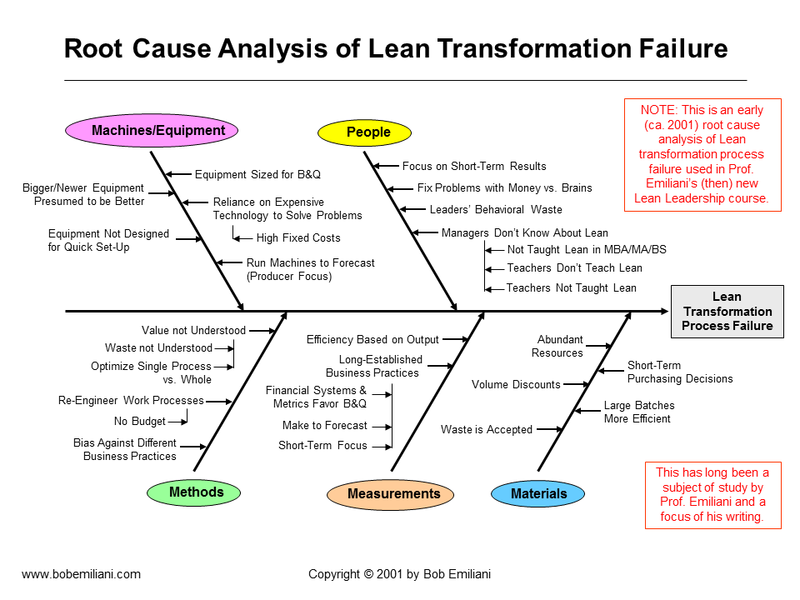 I hope you share my vision to study Lean failures and put an end to Fake Lean. Let’s improve together! Your words on lean failure are aligned with my thoughts about. I have been working on a generic and specific set of barriers to lean transformation (described in my book) to explain and avoid failure. We need an actionable method to overcome them. Good article, Bob. We are forming a group in Portland, Oregon to address just this exact problem. We feel that, after meeting for the last 8-9 months, we have a workable answer to test. We have presented this vision and mission to the Lean community here at our Lean UnConference last week. Our idea is that Lean has been used in a mechanistic paradigm, and that our Lean practice must evolve into an organic paradigm, much as we are observing in many of the modern startup cultures. The core of our idea is that of the Living Organization and the ARC model (Activities, Relationship, Context). We feel that we can make a large difference in Lean Transformation and adoption. I report this here because we find a very important core value of ours is respect for people, empowerment and development. Thank you for this site and your articles; they have been helpful. Hell Ernest Thank you for informing me of this. Regarding “Lean has been used in a mechanistic paradigm, and that our Lean practice must evolve into an organic paradigm.” Moving from mechanistic to organic still involves fundamental changes in thinking that may not occur and could derail Lean efforts. Please have a look at my failure analysis template for ideas on some of the things that you will have to confront even in an organic paradigm. I suppose the Lean Enterprise Institute and the Lean Enterprise Academy have never come across the “Systems Approach to Failures” and probably don’t understand purposeful human activity systems and “Systems Thinking”. Systems engineering and systems dynamics are just a part of systems thinking. Great article . If reflects the quote from one the Great Indian Philosopher Chanakya “Learn from the mistakes of others, you can’t live long enough to make them all yourself”. If you want to implement TPS manager should not just report the success. He should explain what challenges you faced what kind of things did not work well during the Kaizen project. TPS evolved through trial and error. So the real Kaizen masters definitely know what works for this genba condition what won’t work.This is mainly they know the failure case studies.